Fire fighting robots also known as vision guided robots, are capable of detecting the fire and extinguishing it. 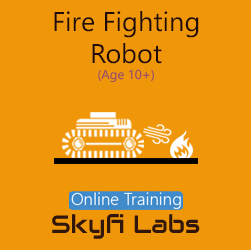 Through this school robotics project-based course, your kid will learn to build his/ her very own fire fighting robot that uses digital IR sensors to detect the fire and move in that direction to put it off using a DC fan. To ease your kid's programming learning experience, the course is equipped with scratch based block programming modules that make programming the robot super easy. 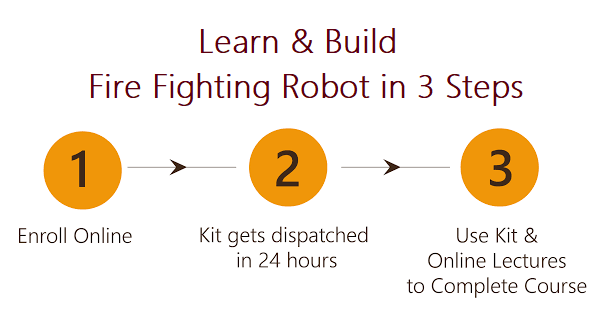 So you need not require any prior programming experience to help your kid to build this fire fighting robot. Learn: What are Fire Fighting Robots?